Cotton yarn is exceptionally nice on the Passap knitting machines if you know how to handle the yarn. You can have it as a tank or have it as a dress. If you would like to save, you can select the monthly video and receive the video for $17.00 a month for a series of videos that will assist you in learning to use your Passap E 6000. Patterns may be purchased separately. If you wish to subscribe, hover over monthly in the navigation bar above to watch a short video about the monthly subscription. You may cancel your subscription at any time if you do not find the instruction is helpful. 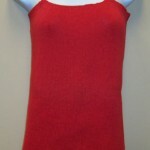 Sign Up for fashionable knit garments designed and demonstrated by knitwear designer Marjorie J McDonald.